This is the 19 December 2005 Last Call Working Draft of the WICD Core. The Compound Document Formats Working Group explicitly requests comments on this specification. Please send them to public-cdf@w3.org. This list is archived and acceptance of this archiving policy is requested automatically upon first post. To subscribe to this list send an email to public-cdf-request@w3.org with the word subscribe in the subject line. This document defines a Web Integration Compound Document (WICD) Core, which is based upon the Compound Document by Reference Framework 1.0 and serves as a foundation for the creation of rich multimedia content profiles and describes rules for combining eXtensible Hypertext Markup Language (XHTML), Cascading Style Sheets (CSS), and Scalable Child Element formats, such as Scalable Vector Graphics (SVG) and SVG Tiny in a non device specific manner. 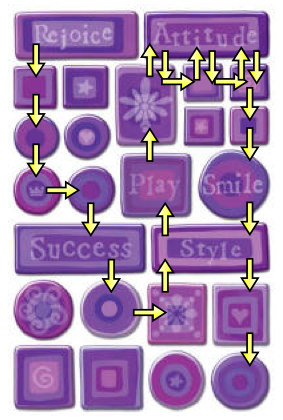 Scalable Child Elements appear as rectangular objects, which in their normal presentation, fit the screen, because they are scalable and usually ment to be looked at as a whole. Scalable Child Elements can be documents (e.g. SVG). They can also be non-documents (have a binary format or be applications). 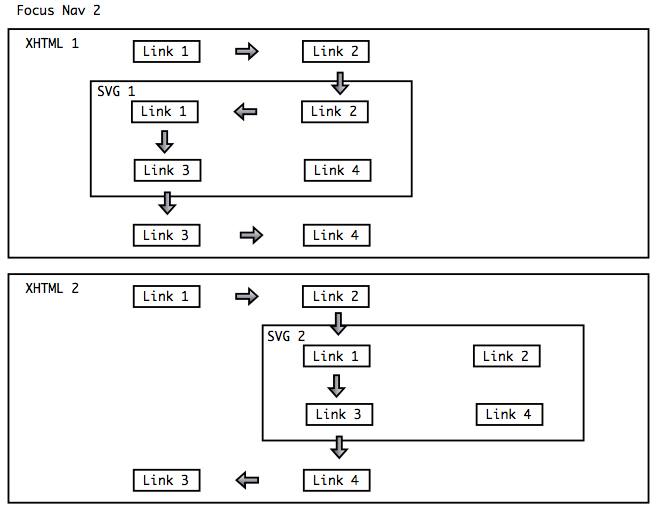 WICD Core 1.0 mandates one specific Scalable Child Element format: SVG. Later versions of WICD Core may mandate additional formats. 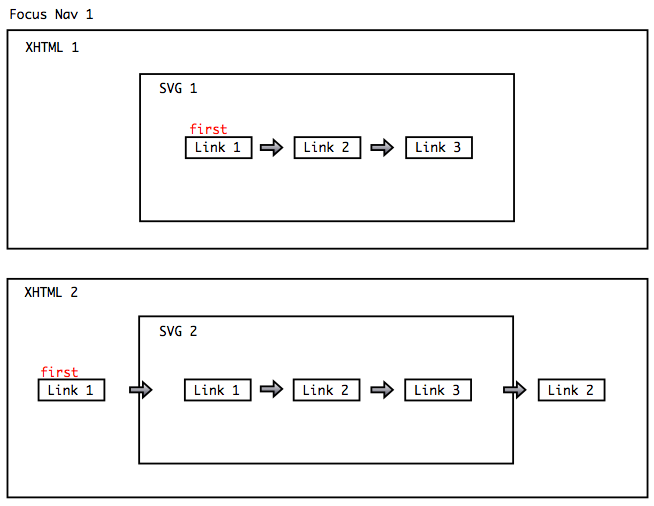 Different WICD profiles may support different versions of SVG. Any Scalable Child Element must support these three use cases. User agents must support Scalable Foreground Child Elements, which may be animating, interactive and may have embedded links. Using a param element with name="render", the document author can specify whether a frozen, static, or dynamic rendering is desired. The terms static and dynamic have the same meaning as in SVG. The term frozen implies a single conversion to a raster image. A param element with name="render" and value="dynamic" shall result in a dynamic rendering. Links shall be activatable. Animations shall play, if the timeline has started. Modifications made by script shall update the rendering. If the rendering area changes size, the rendering shall update. A param element with name="render" and value="static" shall result in a static rendering. Links shall not be activatable. Animations shall not play. Modifications made by script shall not update the rendering. If the rendering area changes size, the rendering shall update. A param element with name="render" and value="frozen" shall result in a one-time static rendering to a raster image. Links shall be not be activatable. Animations shall not play. Modifications made by script shall not update the rendering. If the rendering area changes size, the rendering shall not update. For SVG child objects, the document time used for rendering a frozen or static image shall be that given by the SVG 'snapshotTime' attribute. If no 'snapshotTime' is present in the animation, a document time of zero (0) must be used. Other Scalable Child Element formats may use a similar mechanism. Scalable Child Elements lacking such capability should use a time of zero (0) for still-image rendering. User agents must support Scalable Child Elements (e.g. SVG's) to be used as CSS background images. Scalable Overlay Objects referred to from the XHTML page may be put in front of, or behind, the default XHTML layer. If only one size attribute value is provided, a fixed aspect ratio child element will get 'rightsized' proportionally, by being scaled to fit into the destination box. The following illustration shows, how a square, scalable element, with a fixed aspect ratio, is being scaled into an available area (destination box) with a requested width of 100%. However, this request cannot be completely fulfilled, because the height of the resulting viewport would rise above the height of the available destination area. As a result, the child element's viewport will gain the width and height of the destination box, but the width and height of the resulting viewbox will be equal to the height of the available area. Visible leftover margins will appear to the left and right of the child element's viewbox. The following illustration shows, how a square, scalable element, with a fixed aspect ratio, is being scaled into an available area with a requested height of 100%. However, this request cannot be completely fulfilled, because the width of the resulting viewport would rise above the width of the available destination area. As a result, the child element's viewport will gain the width and height of the destination box, but the width and height of the resulting viewbox will be equal to the width of the available area. Visible leftover margins will appear above and below the child element's viewbox. The child element must render any leftover margins. Child content transparency composite onto the parent document transparency. Which elements qualify as focusable elements must be defined by this specification or by the profiles that are built upon this specification. Advertising focusable property depends on the used namespace. For example in XHTML, this can be done using an anchor element. 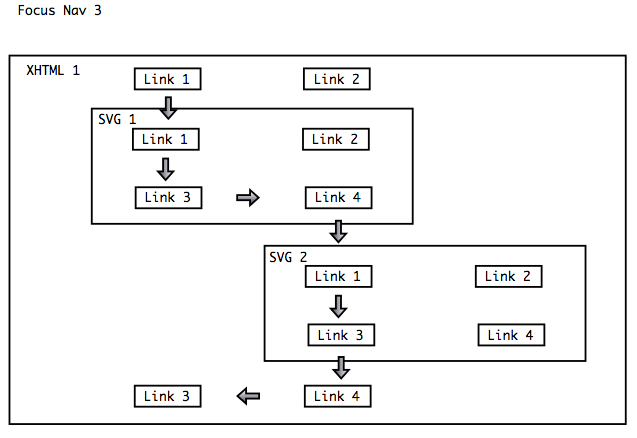 In a similar way in SVG, elements advertise that they are focusable by setting the focusable attribute [SVGMobile12] or by using embedded links. In the context of WICD Core, however, user agents must at least provide one default system font (including a missing glyph, AKA 'Replacement Character', Unicode notation U+FFFD) to all components, such as browsers, SVG engines and other renderers. If there isn't enough information in the font to display a particular character, then the missing glyph is used. In both XHTML (using CSS) and SVG, font selection is done by the font-family property, which takes a list of font family names. (This is combined with other properties such as font-weight to select a specific font face). The family names should match exactly - Times will not match Tymes or 'New Times'. A param element with name="timeline" and value="disable" shall prevent the timeline of the Scalable Child Element from starting or, if already started, shall stop it. Thus, animations will not play. A param element with name="timeline" and value="enable" shall allow the timeline of the Scalable Child Element to start. Thus, for dynamic rendering, animations will play. If previously stopped, the timeline shall reset and re-start. In conformant content, SVG is referenced from XHTML using Object tag. In conformant content, XHTML's Object and SVG's Audio and Video tags can be used to reference audio and video content. Conformant user agent must support multiple animating SVG images with embedded links that is referenced from XHTML. Conformant user agent must support Scalable Child Elements as foreground objects, as background images and as overlays objects..
Conformant user agent must provide a mechanism to move focus to all focusable elements. Conformant profile must support XHTML as root document format. Conformant profile must support SVG as referenced document format. Conformant profile must support CSS as style language.